Fireside is dedicated to meeting the Scriptural needs of the Catholic community through the production and distribution of the highest quality bibles and support materials at the lowest possible prices. We are committed to complete satisfaction through fast, friendly, and dependable service to every customer. The Fireside Study Edition and the Fireside School and Church (large and regular print) cover materials exceed specifications of the National Association of School Textbook Administrators (NASTA) giving them lasting staying power. Right-grain printing and high grade acid-free Bible paper allows each book to open flat without cracking the spine. Every Fireside Bible is backed by a guarantee. . . even against loss. View our "Guarantee Certificate". All Fireside Bibles carry and unconditional lifetime guarantee. 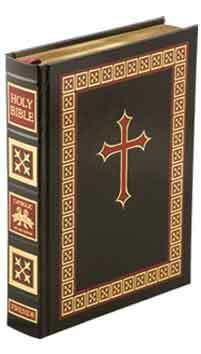 Any Bible with material or manufacturing defects will be repaired or replaced at no charge to the original owner. From "concept to carton" every Bible decision made at Fireside is governed by a commitment to quality in design and construction. We take meticulous care to ensure that your Fireside Bibles arrive in flawless condition. Every order is processed the same day we receive it. Fireside believes that a Bible should look like a Bible. That's why all of our cover materials are chosen with extra special care. Luxurious bonded-leather and durable nylon reinforced cover materials meet the highest standard set in the textbook industry. Choose a high quality leather Bible with Fireside. The stay-flat lamination process used on the Fireside softcover editions sets them apart. We guarantee that they will last longer. The moment you pick up a Fireside Bible, you know it's not just another textbook. That's no accident - and there are several reasons why! First: Fireside Bibles are manufactured so that the pages fold in the natural direction that the paper was made. It's a more expensive process known as "correct grain" or "right grain" printing. That's why every Fireside Bible falls open and lays flat without breaking the spine. Secondly: The perfect-bound technique used in Fireside Bibles has proved to be very durable. You can count on every Fireside Bible for years to come. Even the selection of paper sets Fireside Bibles apart. We use only the finest in lightweight, acid-free Bible paper. What results are Bibles with pages that will withstand rugged daily use and never turn yellow or brittle over time. One touch in comparison to any other Bible reveals the paper quality we insist on.